Today we have dozens of messaging technologies, countless ESBs, and nearly 100 iPaaS vendors in market. This leads to questions about how to choose the right messaging technology for the user needs – particularly for those who have already invested in a particular choice. 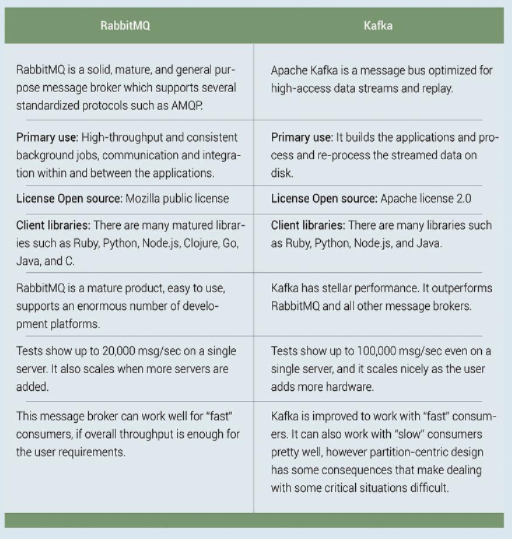 This post explains you, starting with the most modern, popular choices of today: RabbitMQ and Apache Kafka. So, explore this article and know the major differences between these two technologies. Apache Kafka is developed in Scala and started to connect various internal systems. Kafka is one of those systems that is very simple to describe at a high level, but has an incredible depth of technical detail when you dig deeper. The Kafka documentation does an excellent job of explaining the many design and implementation subtleties in the system. Kafka is well adopted today within the Apache Software Foundation ecosystem of products and is useful in event-driven architecture. //Kafka Consumer subscribes list of topics here. // print the offset,key and value for the consumer records. Message queues is a broad and interesting topic, in this article we just checked the tip of the iceberg. Kafka is good for “fast” and reliable consumers. RabbitMQ is good for “slow” and unreliable consumers. We recommend you to use as per your analysis and project because, real systems are more complex and the above conclusion is not optimal for every situation. KAFKA, RABBITMQ RabbitMQ Vs Kafka by admin.